As technology improves, the reality of augmented reality (AR) is finally getting real and retail projects are helping to pioneer the way, with Google and Apple at the helm. AR technology superimposes a computer-generated image on a view of the real world, integrating both digital information and the user's environment in real time. While virtual reality creates a completely artificial environment, AR uses the existing reality and overlays information on top of it. The next version of iOS (iOS 11) is expected this fall and a new API Apple is introducing, ARKit, lets developers build complex AR features into their apps. Tim Cook, the CEO of Apple Inc., told Bloomberg Businessweek in June that he sees AR as profound. "I am so excited about it, I just want to yell out and scream. The first step in making it a mainstream kind of experience is to put it in the operating system. We’re building it into iOS 11, opening it to developers and unleashing the creativity of millions of people. Even we can’t predict what’s going to come out." Apple is not the only tech giant embracing the AR craze. Google Tango is an AR computing platform, which enables, through the use of sensors, a mobile device to map indoor spaces and to know the location of the device, essentially giving the device the ability to understand space and motion like humans do. The ASUS ZenFone AR and The Lenovo Phab 2 Pro are the two smartphones that include Tango. At the recent Google I/O 2017 conference, the company announced VPS, or Virtual Positioning System — a system that allows users to be tracked in a space through a phone’s camera. The new technology was developed in conjunction with Google Maps and enables users to locate items inside of stores or community spaces. Lowe's Innovation Labs announced Google will map 400 Lowe's stores using VPS (more below). IKEA confirmed this June it’s developing an augmented reality app with Apple, which will debut this fall once iOS 11 becomes available. The app will help IKEA customers visualize what IKEA products will look like in their own homes, before buying the products. “This technology makes it easier to make buying decisions in your own home, get inspired and try many different products, styles and colors in real-life settings with the swipe of your finger," said Michael Valdsgaard, leader digital transformation at Inter IKEA Systems. "I think that augmented reality and virtual reality will be a total game changer for retail in the same way as the Internet. Only this time, it will be much faster, and accessible to billions of customers using iPhone and iPad." According to Valdsgaard, Apple’s new platform available with iOS 11, ARKit, has solved critical technical hurdles that help make AR a more accessible tool for real-life decision making. 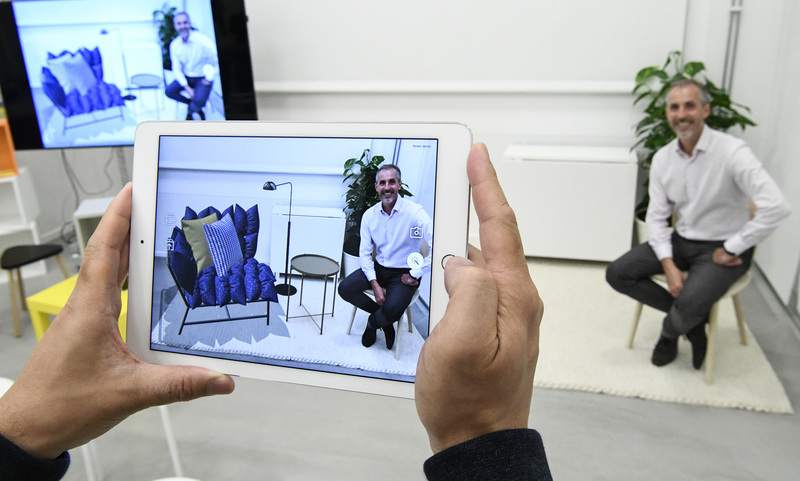 The new app builds on the augmented reality experience IKEA gained through its IKEA catalog app “Place in your room,” which let customers visualize 3-D versions of Ikea’s furniture in their homes. Shoppers were able to use the 2014 IKEA catalogue feature by scanning select pages in the printed catalog with the IKEA catalogue app, then placing the physical catalog where they wanted to see furniture. Their device’s camera uses the book to gauge the correct scale for a virtual version of the product with the room in the background to appear onscreen. 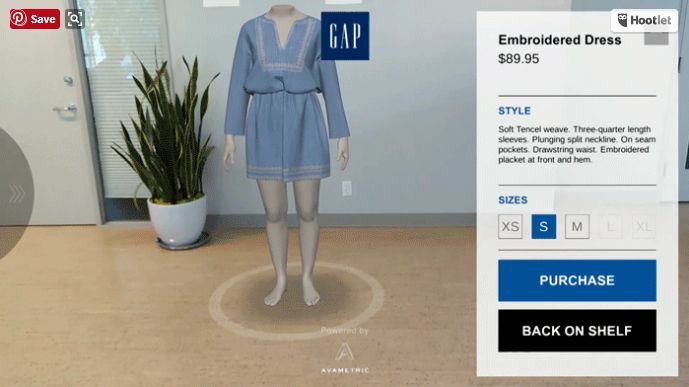 GAP announced the pilot of its DressingRoom by Gap AR app at this year's Consumer Electronics Show (CES), to help customers virtually “try on" clothing. The app allows customers to choose an avatar based on their body size (five body types are available) and try on different products. With a Google Tango-enabled device, customers can then virtually walk around that avatar to see how the product fits, how the fabric drapes and how the color looks in different lighting. And, if they are deciding between sizes, customers can view side-by-side avatars to explore how different sizes will fit different body sizes. If they like the product they can then purchase it online. "Gap has been working on the fit of our products to better match the way customers are shaped instead of just looking at 'fit model' sizes," said Gil Krakowsky, Gap's VP global strategy and business development, in its aDressed blog. "One of our top priorities is continuing to improve our technical knowledge around how fabric stretch, drape and feel impact the sensation of fit. A lot of that customer information was inputted into the Avametric technology, backed by the Google Tango platform and ASUS hardware, to develop the DressingRoom by Gap pilot app we're looking at today." The app is available for demo on a Tango-enabled device and was created in collaboration with Google and Avametric, a San Francisco-based app developer. Gap PR Director Mackenzie Dougherty told RIS News that "currently, the DressingRoom app is only available on devices that are enabled by Google’s Tango platform. We are continuing to explore how the DressingRoom by Gap pilot app will work for our customers and stores, and how it can be used to improve the browsing and shopping experience." 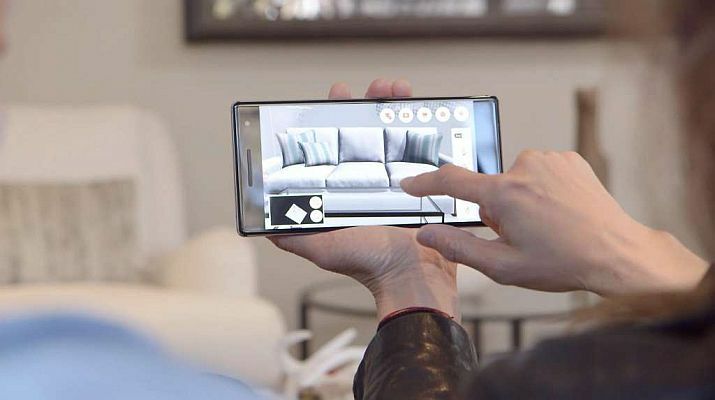 E-commerce retailer Wayfair launched WayfairView, the company’s in-house developed smartphone augmented reality application, to allow shoppers to "try on" furniture and décor in their homes before they make a purchase. Developed by Wayfair Next, the company’s research and development team, using Google’s technology, the app lets shoppers view a room in their home, select a Wayfair product and virtually place that product in the room to see how it fits and looks within the space. Shoppers can also move and rotate products to visualize various layouts and perspectives. Finally, when ready to make a purchase, shoppers are seamlessly connected to Wayfair’s shopping app via Google Play. Williams-Sonoma, parent company of the Pottery Barn and PBteen, launched its first Tango Augmente­­d Reality application, as well as 3D room design and product visualization tools this year. ­­ The smartphone AR app "3D Room View" by Pottery Barn is also powered by Google's Tango technology. 3D Room View launched with a focus on the living room and will add additional spaces over the course of the year. The app allows customers to either add products to an existing room, enabling them to see how new products will look with their current furniture and decor, or they can empty the room to start the design process from scratch. The app offers five living room features to start: customers can add, move and remove items, change the color of the upholstery or pillows, and zoom in to see details. Customers will have access to 3D Room View with the help and expertise of in-store design specialists at select Pottery Barn stores in the San Francisco Bay Area, with plans to roll out across the country. “Our brands have always been a source of inspiration for customers, and we’re excited to enhance that experience by introducing the latest AR technology and visualization tools to help customers design a room by envisioning how Pottery Barn products will look and fit in their actual space,” said John Strain, EVP, chief digital and technology officer, Williams-Sonoma. 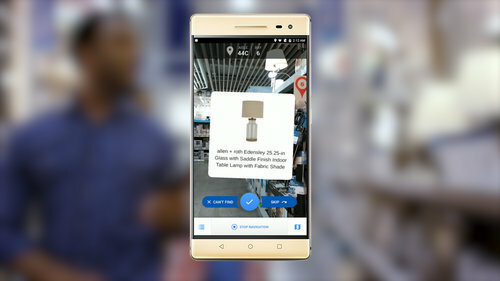 "Lowe's Vision: In-Store Navigation," app also utilizes Google's Tango augmented reality technology. The mobile app for in-store navigation employs AR tech to enhance the shopping experience, but it is available in just two stores, one in Sunnyvale, CA, and another in Lynwood, WA. However, Lowe's Innovation Labs recently announced Google will map 400 Lowe's stores using its newly announced VPS. 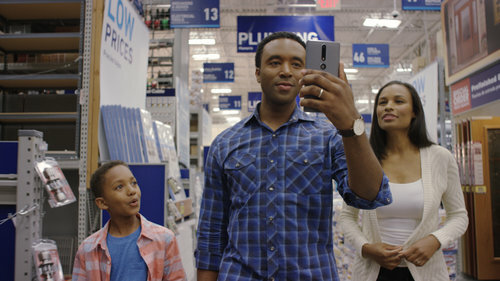 The tech helps devices quickly and accurately understand their location indoors, and for Lowe's, VPS can help customers find products in the store more efficiently. The app lets shoppers with Tango-enabled smartphones search for products, add them to a list and find them using AR. As shoppers traverse the store, the app provides directional prompts overlaid onto the real-world setting to guide them through the most efficient route. The Tango technology uses motion tracking, area learning and depth perception to guide customers through the store using a mixed reality interface. "Our research shows that helping make it easier for customers to find products in stores not only makes for a better shopping experience, it allows our associates to spend more time advising on home improvement projects," said Kyle Nel, executive director of Lowe's Innovation Labs. Lowe’s has also introduced Holoroom How To, an on-demand virtual reality skills clinic, at the Framingham, MA, and Burlington, Canada, stores and RONA, a wholly-owned subsidiary of Lowe’s Big Box, in Beloeil, Québec. The simulated experience explores the relationship between virtual reality technology and engagement and retention in learning. When users put on the virtual reality headset and hold the controller in each hand, they are immersed in a DIY project – such as tiling a shower – and given step-by-step instructions to complete the task. From mixing the mortar to laying the pattern, the simulation walks the user through each step of the process. Haptic feedback, such as feeling the vibration of a drill through the controller, adds to the life-like experience. Beauty retailer Sephora allows shoppers to virtually try on thousands of lipstick shades prior to purchase. The Sephora Virtual Artist uses ModiFace technology, which utilizes a smartphone’s camera to map the precise location and shape of the user's facial features, including lip location and shape. Beauty junkies can swipe through over 3,000 lip colors by brand, format or shade family, and instantly see how each one looks on their own lips. Using a state-of-the-art 3D Live view that moves with them like a mirror, clients can virtually try on lip colors through an interactive digital overlay on their own lips. All lipsticks and lip glosses available at Sephora are available to try on and each was individually color matched by hand by Sephora experts to ensure a true representation. Sephora Virtual Artist also includes fun mobile features like "Shake it Up," which selects four new shades at random each time the user shakes their phone. Images can be shared socially or e-mailed with product links.